Binary UniCoat is a dual-luminophore pressure sensitive paint (PSP) packaged in an aerosol can for ease of application. 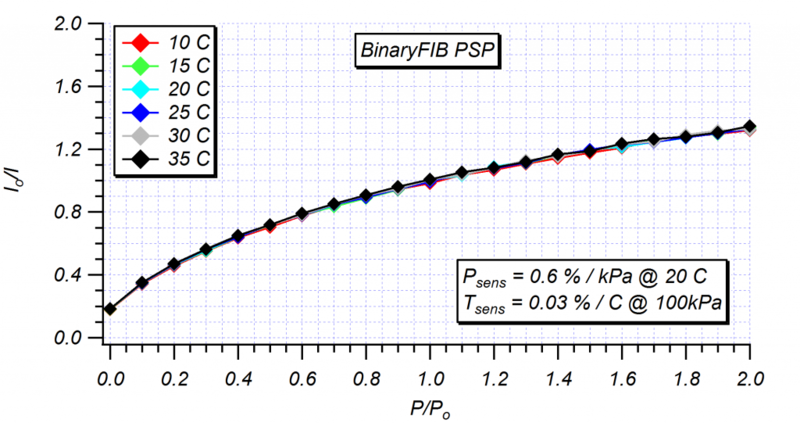 The binary PSP approach involves acquiring data from two distinct luminescent dyes and using these signals to compensate for errors caused by model displacement and deformation. 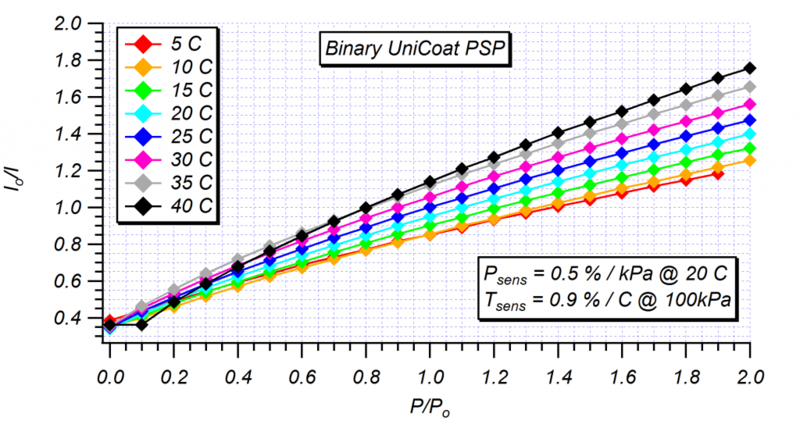 Binary UniCoat has higher temperature sensitivity and lower pressure sensitivity than FIB based paints as shown in the calibration below. A desirable feature of Binary UniCoat is ease of application. Simply shake the can and spray the surface. The result is a single coat application paint that may be applied directly to most materials. 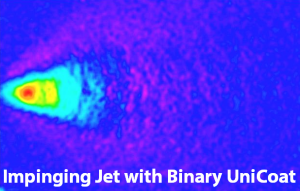 Binary UniCoat is an effective quantitative PSP in isothermal environments (large metal models and temperature controlled tunnels) or where strong pressure variations are present (transonic flows). It is also effective in compensating for errors due to model displacement and deformation. Binary UniCoat is recommended for introductory PSP users who seek an inexpensive means to gain experience with binary paints. BinaryFIB® pressure sensitive paint is a dual-luminophore, single application PSP formulated to be applied with paint spraying equipment. 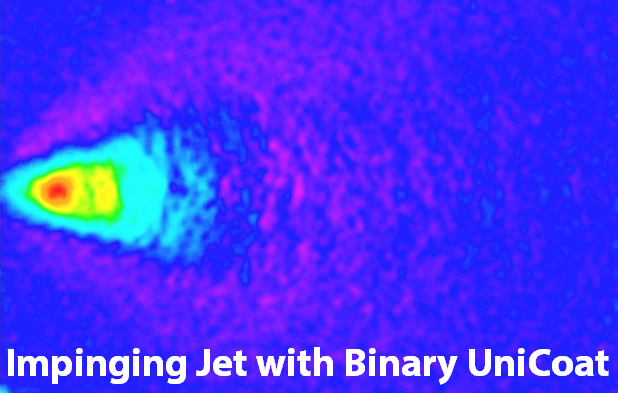 The binary paint approach involves acquiring data from two distinct luminescent dyes and using these signals to compensate for errors caused by model displacement and deformation as well as temperature. One dye is pressure and temperature sensitive and the other dye is temperature sensitive only. The ratio of the signals from the two dyes allows the temperature sensitive signal to be isolated from the pressure sensitive signal. The temperature sensitivity of the paint can be minimized over a wide range of temperatures and pressures as shown in the calibration below. The paint may be applied to most materials, however a white base coat such as epoxy screen layer or FIB Basecoat™ is recommended. Models constructed of materials that may be attacked by solvents such as plastic or rapid prototyping resin should be coated with a screen layer or FIB Basecoat™. The calibration of BinaryFIB® is very stable, repeatable, and exhibits very little temperature sensitivity. 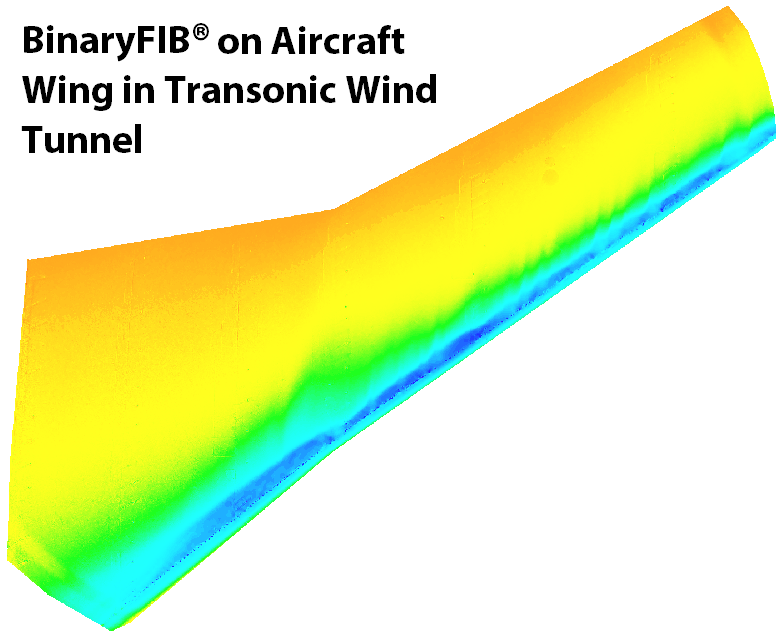 BinaryFIB® is recommended for advanced/professional PSP users who seek high quality data in low-speed environments or where temperature gradients are larger and have a greater impact on the signal-to noise ratio.